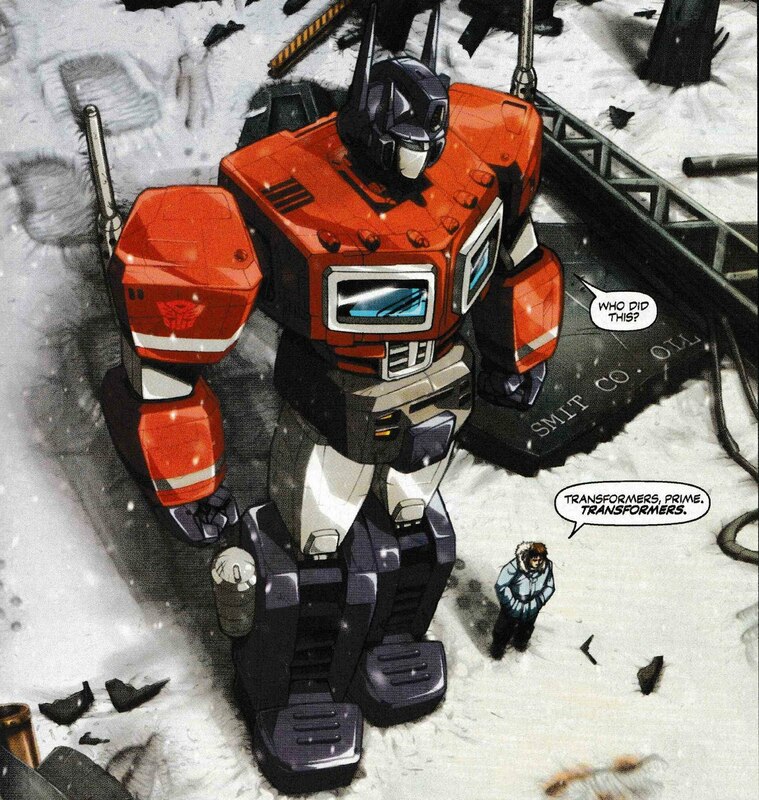 The two biggest loves of my childhood were Transformers and comic books. 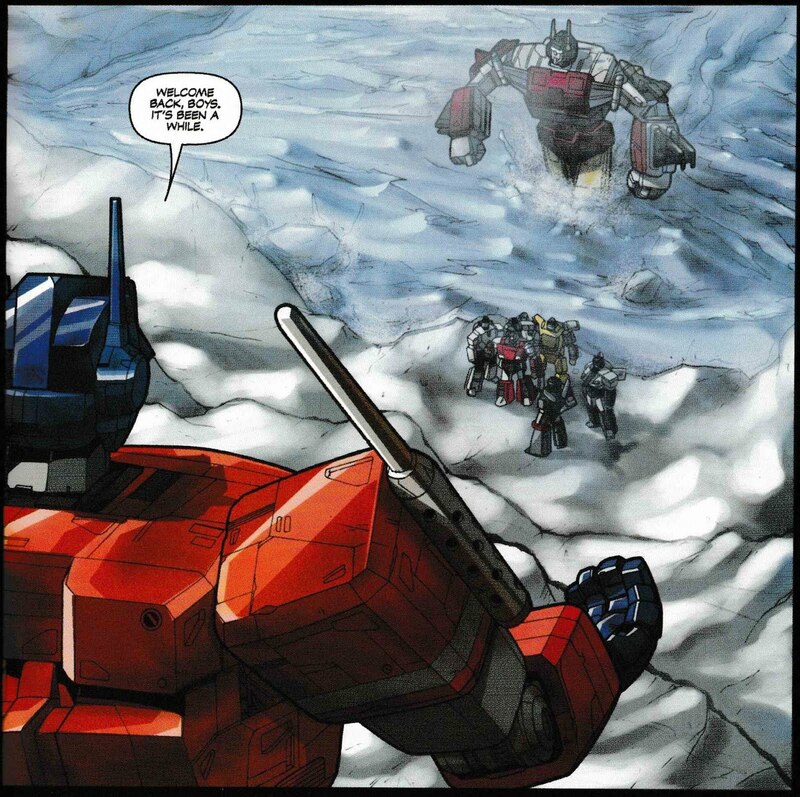 In fact, it was my love of the Transformers that led me to read the Marvel Transformers comics, and my love of comics expanded from there. Eventually, as I grew in age if not size, other concerns took over my life, like girls, and… well, girls. So comic books became a thing of my past. I briefly returned to the medium in the mid-‘90s, around the time of Heroes Reborn and Return. (I specifically remember getting the big climax to the Spider-Man Clone Saga off the shelf. I thought it was going to be so valuable, with it bringing Norman Osborn back to life and all. Oh well.) 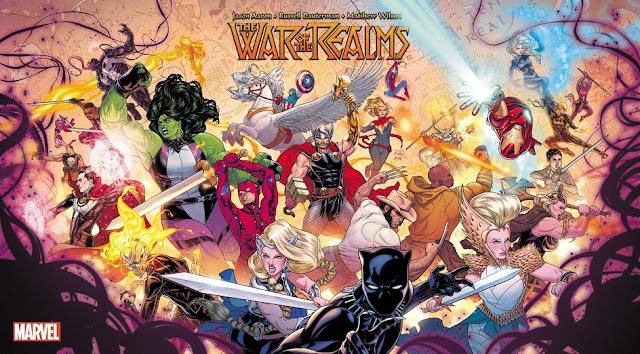 My dalliance back into the world of comics didn’t last long, since I found most of the Heroes Reborn stuff that was big at the time to be, pretty looking but badly written. Fast forward to the year 2001, and the release of the very first Spider-Man movie. As much as I like to criticize it now, that movie was akin to a religious experience for me. When I was a kid, all I wanted in the world was a decent Spider-Man toy, much less a big budget motion picture. I left that movie with a sense of extreme joy, awe, and crushing nostalgia. I also had this strange feeling of sadness, having let go of my massive collection of Spider-Man comics accumulated over an entire childhood, now all far too expensive to ever regain. But I found the local comic shop anyway. 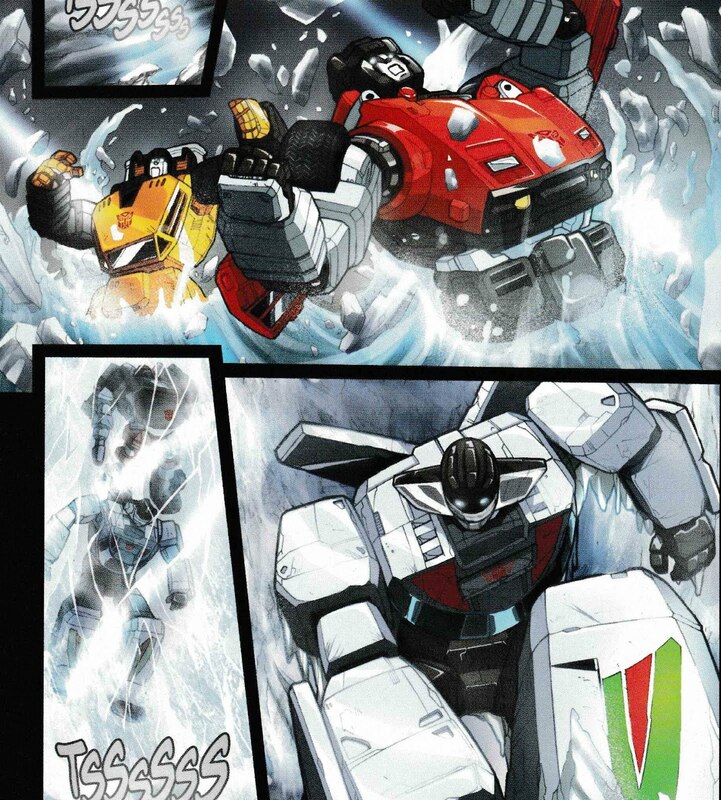 Coincidentally enough, the hottest book in comics was a new Transformers series, by an upstart comics company named Dreamwave. It was nearly impossible to find copies of the early issues of the series, but I scrounged up as many as I could. 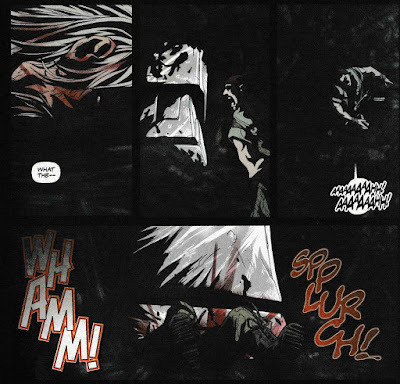 Those comics, along with a relatively new series named Ultimate Spider-Man, had a level of sophistication I didn’t remember from the comics of my youth. (Ultimate Spider-Man #13 was like an atom bomb to me. Never before had I read a comic with such focus on character development, and it also made so much sense for a young Peter Parker to brag to a girl about his powers.) My comic addiction had been re-sparked. However, Dreamwave eventually went out of business around swirling rumors of unpaid artists and massive debt, leaving a catalog of excellent Transformers comics doomed to the dustbins of history. But I say let’s not forget, I say we celebrate these comics that ended up being so influential in the story of my life. With all that being said, I present to you, Dreamwave’s Transformers. 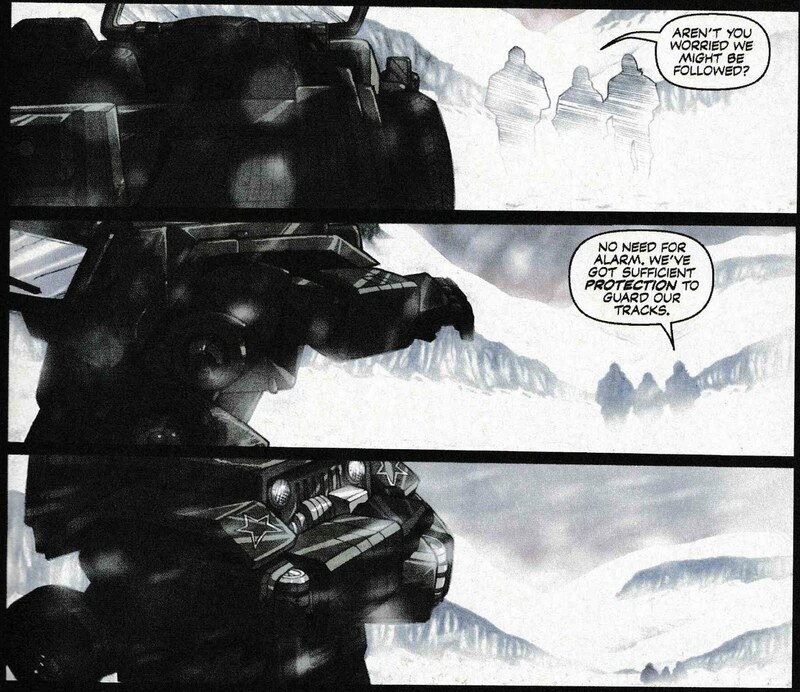 A mysterious man named Lazarus leads a potential investor across a frozen wasteland, towards an unknown investment opportunity. 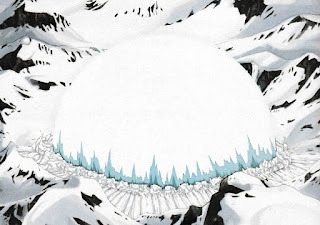 The investor isn’t too happy about having to trudge through such an extreme landscape, and spends the whole time complaining, but his tune immediately changes once they arrive at their destination and see what Lazarus is selling. 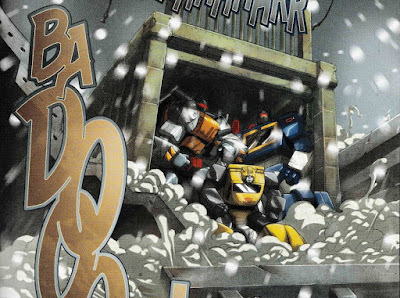 Buried there in the icy ground, is the Decepticon Soundwave. It’s worth noting that the covers for this Transformers series are some of the best Transformers art ever produced. 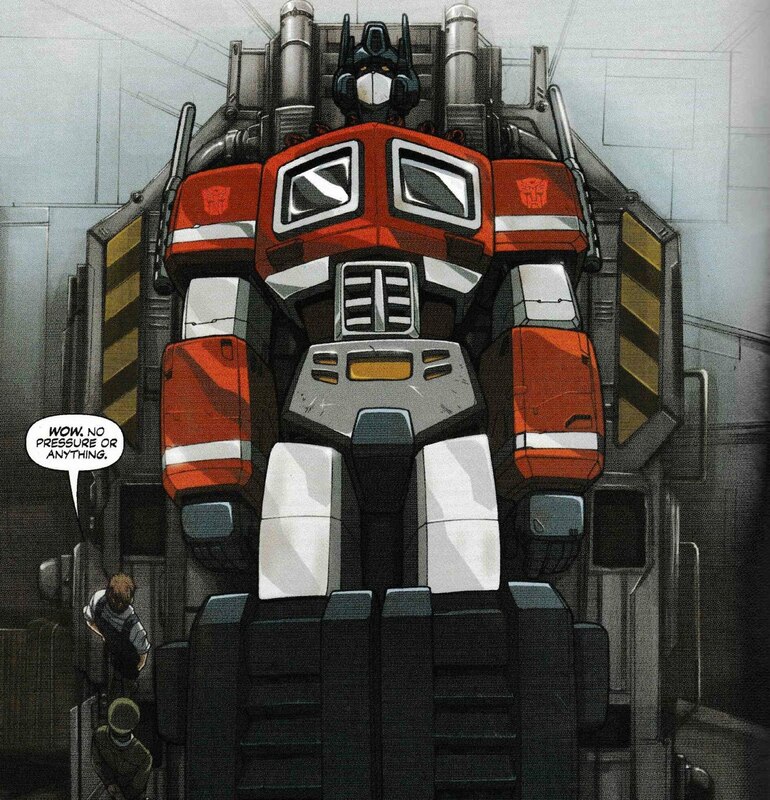 Pat Lee was put on this Earth to draw Autobots and Decepticons, and apparently, not much since. Unless he has, I don’t know, I’m not his caretaker. In the jungles of South America, two unidentified militants stand on guard. One steps away to take a leak, and behind him his partner is snatched away by a giant metal hand. 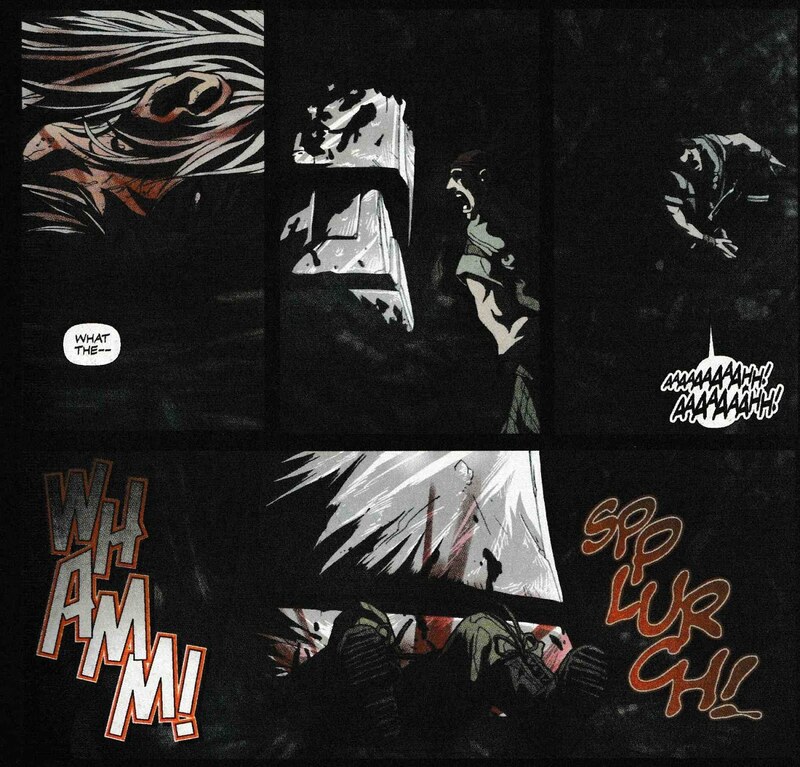 The other searches for his friend, and finds him bloody and broken, but doesn’t have much time before he himself is smashed under the heel of a giant metal foot. Spplurch! I would have been around 23 years old when I read this, so it fit perfectly in my “dark and violent = great” age period. Seeing my cherished childhood friends depicted in such a “realistic” manner absolutely appealed to me on a deep fundamental level. 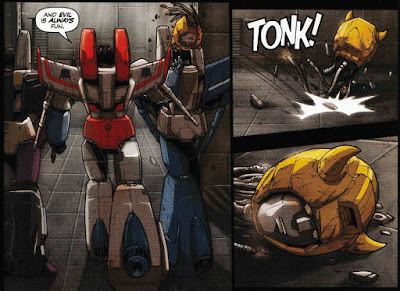 Then again, my favorite issue of the original series is when the Autobots all hung lifeless and deformed from the ceiling, so I was always a little twisted to begin with. In Cleveland, Ohio, Spike Witwicky and his son Daniel’s morning is interrupted by the arrival of two military types. The main guy introduces himself as General Hallo. Spike has been summoned for Top Secret reasons by a secret government institution named the Development of War Technology (DWT) Division. 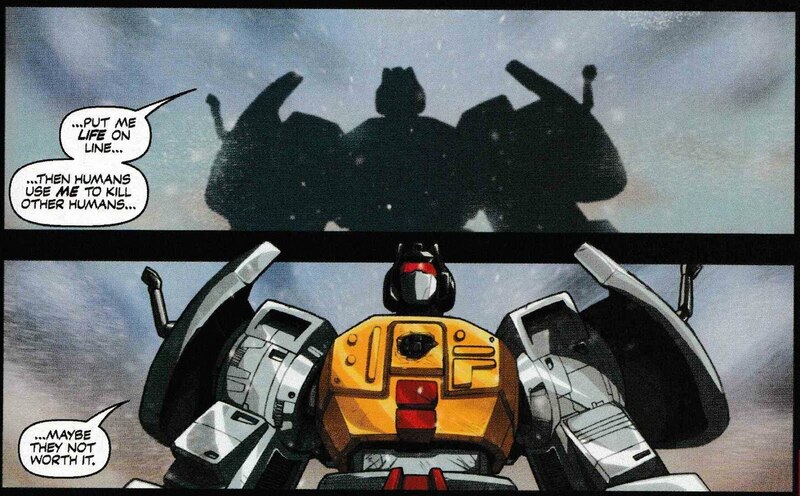 As they disembark the military style jeep and enter the facility, it transforms into Hound behind them. They remove the bag from the terrorist’s head, revealing a large Transformer (that we know to be Starscream). Spike is called in, and greeted by General Hallo again. The General begins to explain Spike’s purpose there by recapping what happened during the Ark Tragedy back in 1999. The Autobots had built a spaceship to take them home, back to Cybertron, and six humans were selected to go with them and get the chance to study intelligent alien life. 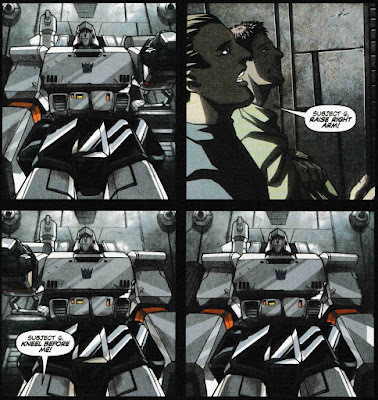 One of the selectees was Sparkplug Witwicky, Spike’s father. Unfortunately, the ship exploded, killing everyone aboard. Or so they thought. All of this fit in perfectly with the timeline of the original Transformers cartoon. It explained the disappearance of Sparkplug between the first two seasons and the movie. The tragedy happening in 1999 fit in just fine with the movie’s timeline of 2005. All of this made this comic that much more exciting and appealing for me. Of course, the sequel ruined all that. 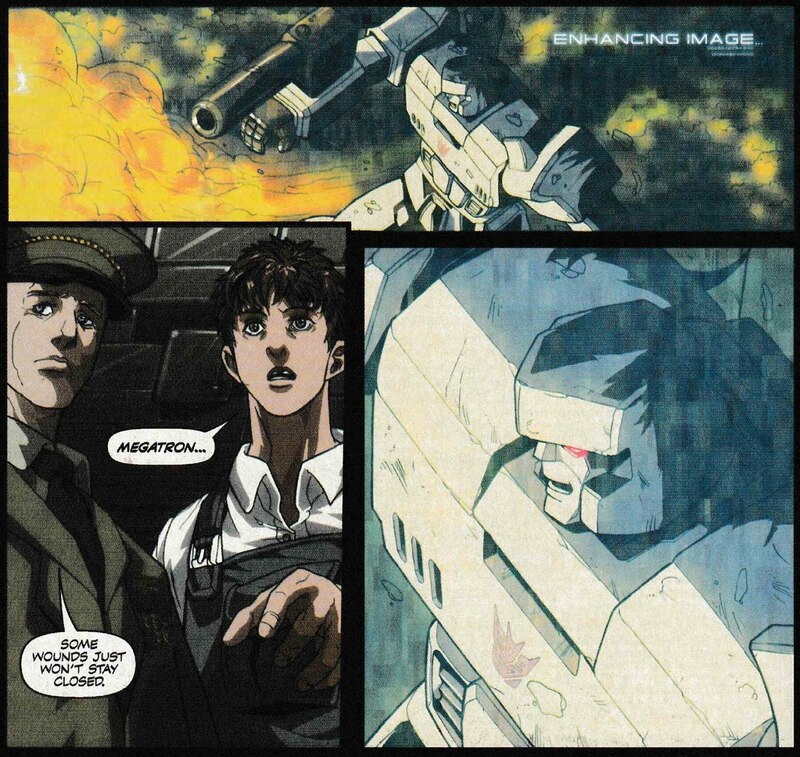 Hallo plays their satellite footage for Spike, of Megatron annihilating a squad of South American rebels. Meanwhile, Lazarus gives the terrorist a tour of his collection. 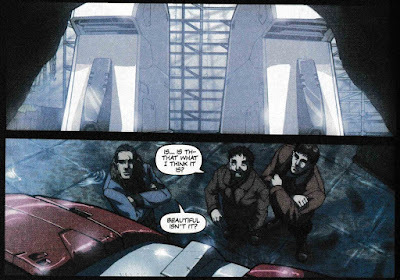 Lazarus explains that they have complete control of the dormant Transformers, but they retain enough of their deductive skill to make combat decisions in the field. Lazarus demonstrates his control by having Megatron stand, raise his left arm, then his right. Elsewhere, Hallo leads Spike to a secret government location designated Area 24. They’ve pieced together that the Transformers obviously weren’t destroyed in the Ark II explosion, but they don’t know who might be working with them, or possibly even controlling them. 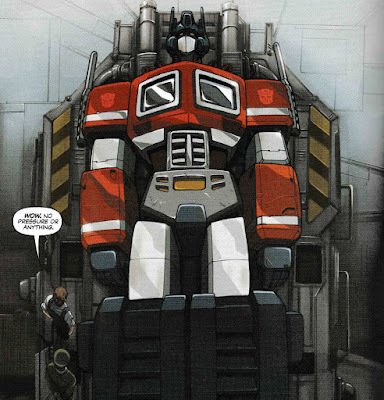 However, they feel that Spike’s history with the Transformers might help them with one of the Transformers they have recovered, Optimus Prime. The issue closes with the newspaper article describing the Ark II tragedy. It seems that the governments of the Earth banded together with the Autobots to defeat the Decepticons once and for all. With the war over, the Autobots built the Ark II to return to Cybertron with the captive Decepticons, along with the small crew of humans. General Hallo needs any help Spike can provide in resurrecting Optimus Prime. 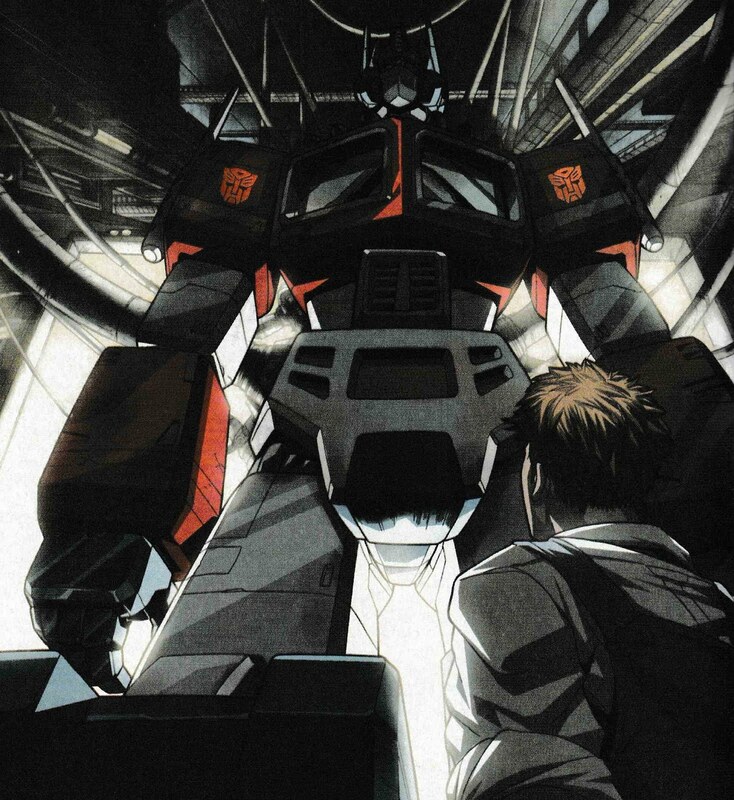 It seems Optimus Prime had given Spike a piece of the Matrix, as a promise that he will return with Sparkplug safe and sound. Despite his anger over that broken promise, Spike understands that if the Decepticons are back, the world will need Optimus Prime, so he restores the missing piece to the Matrix. An oil refinery in the Arctic comes under attack by Lazarus-controlled Transformers, including Bumblebee, Grimlock, Starscream, and Soundwave. Turns out the attack is footage used as a presentation by Lazarus to a group of willing bidders. Lazarus opens the bidding, which instantly gets frenetic with tens of millions of dollars being offered. Lazarus calms the room, and suggests they start the bidding by going through each Transformer one by one, starting with Megatron. 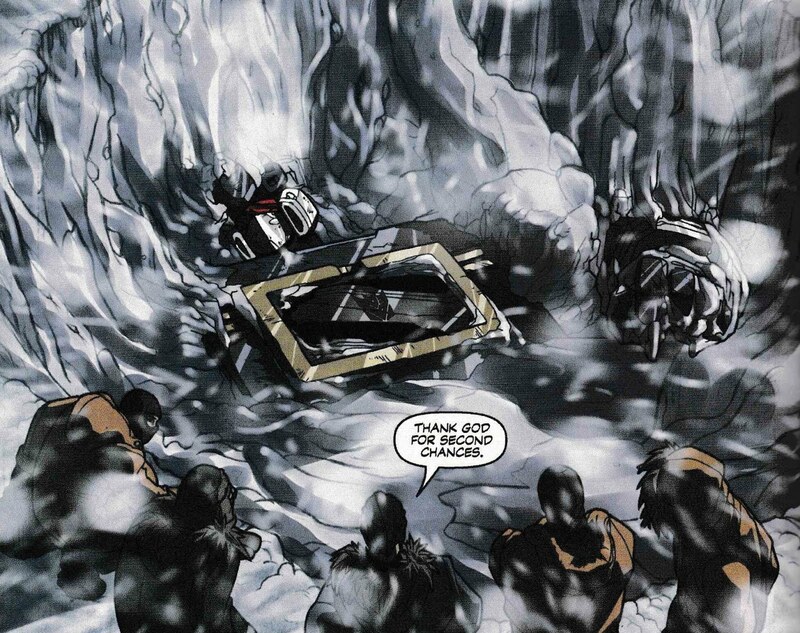 The bidding is quickly interrupted when a clearly-no-longer-under-control Megatron stands up, mocks the humans, and picks up the helpless Lazarus. Hallo and Spike stand with a revived Optimus Prime, near the location where they discovered his inert body. 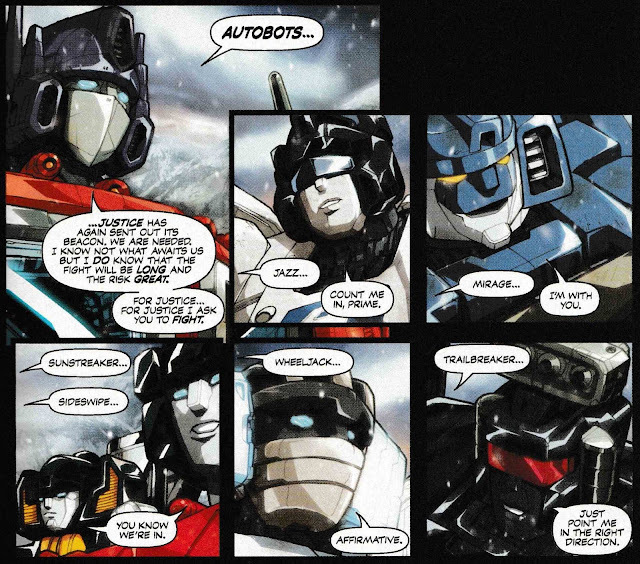 Optimus welcomes back Jazz, Mirage, Sunstreaker, Sideswipe, Wheeljack, Trailbreaker, and Superion to the land of the functioning. A helicopter pilot towing the oil refinery Transformers, returns to Lazarus’ base to find it under attack by Megatron. Optimus Prime and Spike survey the damage at the oil refinery. 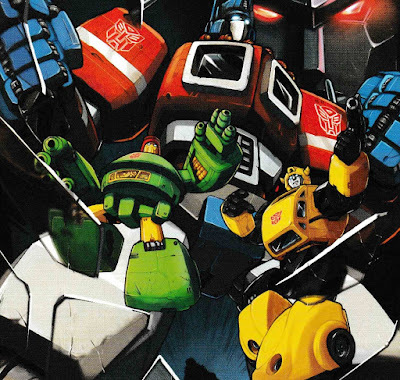 This time, Autobots have blood on their hands, along with the Decepticons. 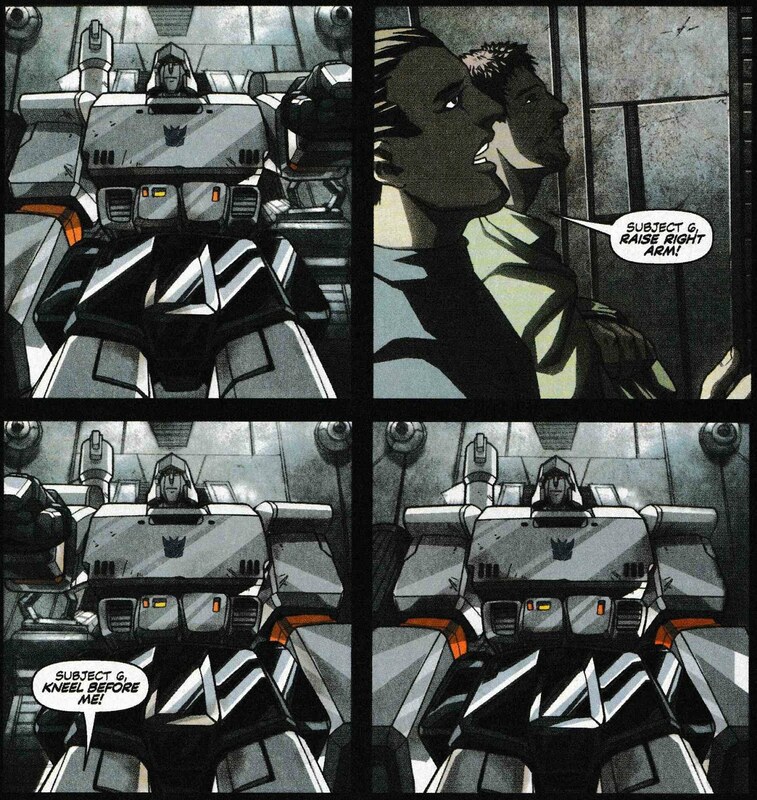 Optimus believes they’re being controlled, but Spike angrily shouts at him that it doesn’t even matter. No matter the intentions, humans are the ones that get hurt in the crossfire. General Hallo tries to reassure Prime, saying that some people don’t understand the consequences of power. Prime is confused to hear that Hallo thinks their war is about power, but they are interrupted by news of the location of Lazarus’s headquarters, and it currently being on fire. Optimus demands they tell him the location. 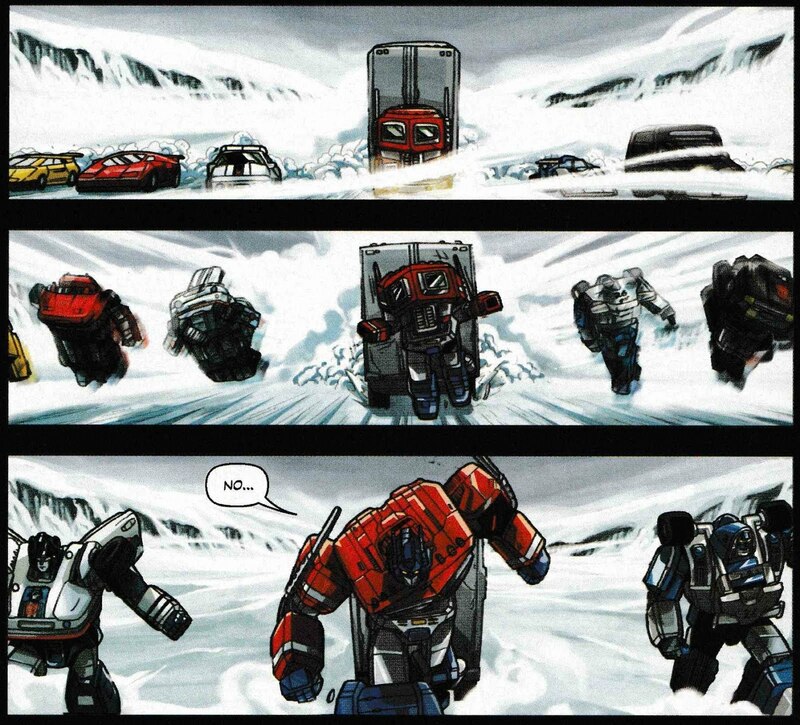 Hallo scrambles his troops, while Prime rallies the Autobots. This time, they will not put any humans in harm’s way. 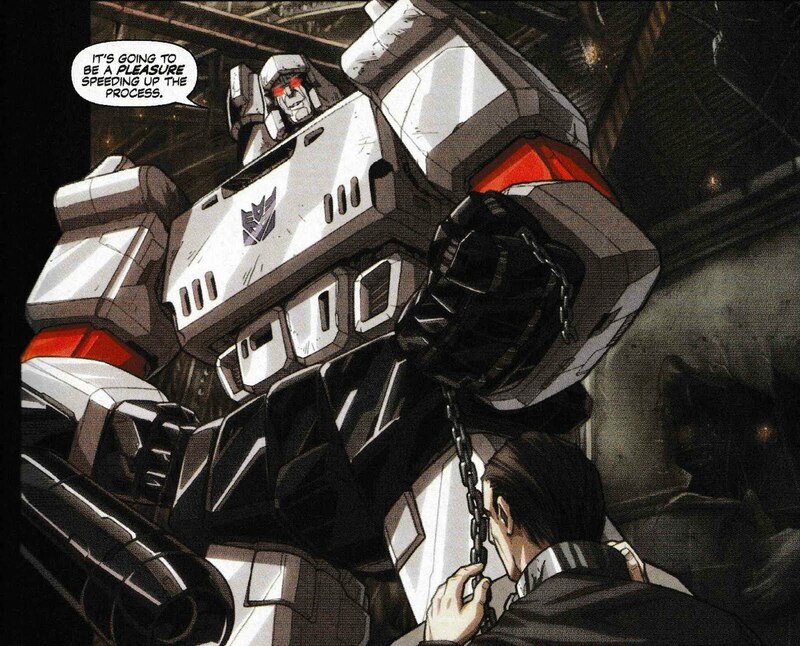 Lazarus is a captive of Megatron (where did he get that chain and clamp?) who mocks his prior boasts about the evolution of warfare. The only thing Megatron is concerned about with the humans is their extinction. Megatron, having restored Starscream, Skywarp, and Thundercracker to their prior selves, tells them to meet with Soundwave, for the next stage of his plan. Soundwave is using the bodies of the captured Autobots to power a device that will turn the Earth into lifeless metal, beginning with Lazarus. Optimus Prime and the Autobots arrive (in a spectacularly illustrated scene). Megatron and Optimus launch into their usual rhetoric. 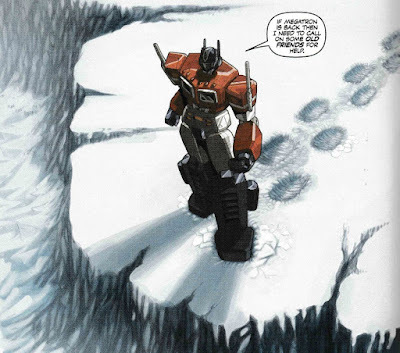 However, this time, Grimlock has lost faith in the humans, and therefore the Autobot cause. 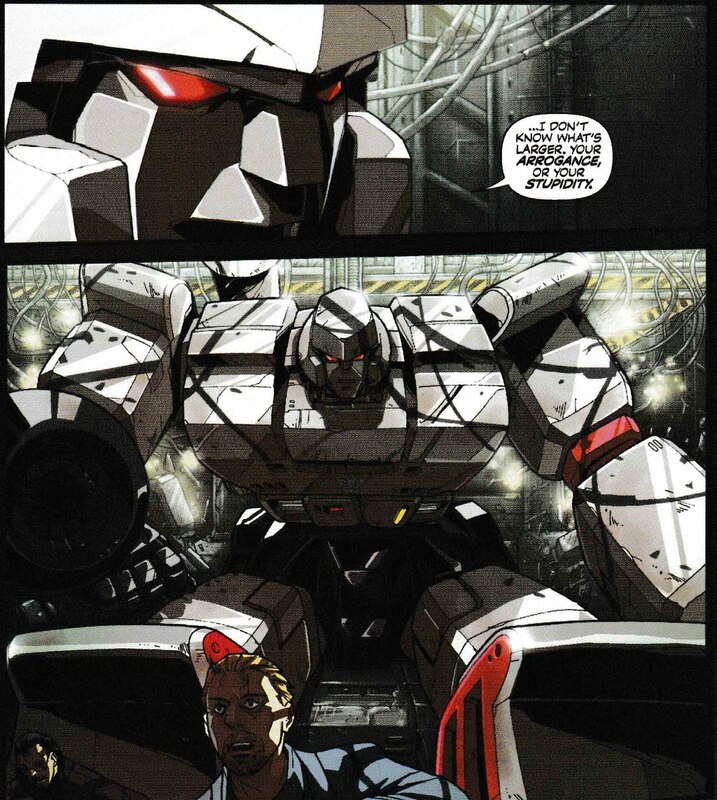 This time, he sides with Megatron. With both sides unwilling to budge, it’s time to start the shooting and punching. Hallo’s troops arrive with Spike along for the ride. Confirming that the Transformers are no longer under outside control, Hallo’s team initiates Phase B. As the Transformers fight each other below, the humans drop an (I assume) atom bomb on them. Around 19 years old was when I first started getting nostalgic for the Transformers. Unlike now, that was a time before DVD box sets, or trade paperbacks collecting every comic ever produced, so it was difficult scratching that particular itch. I remember finding someone on the internet that made VHS copies of a set amount of episodes that you requested of the original cartoon, for a fee of course. I remember trying to remember all my favorite episodes of the series and mailing off that order. The comics were a harder find. I dug through my LCS’s quarter bins and found a handful, but my biggest score came when I just happened to be there while they got in a stack of the last 20 or so issues of the Marvel series. It wasn’t the run I grew up with, but it would have to do. Matter of fact, this might be what got me back into the comic store in the ‘90s in the first place. See how it all revolves around the Transformers? I was characteristically long-winded this week, so I’ll end this quick by saying something appropriately suspenseful, like… come back next week. But seriously, please come back. I need the validation.